The apse showing The Crowning of the Holy Virgin is one of Calì’s greatest works and his first ever work for the Basilica of Our Lady of Porto Salvo in Valletta. As a result of this conservation project, Calì’s vibrant pallette has once again been revealed, giving strength to the overall composition that is now presented in all its intended depth and spatial dimension. 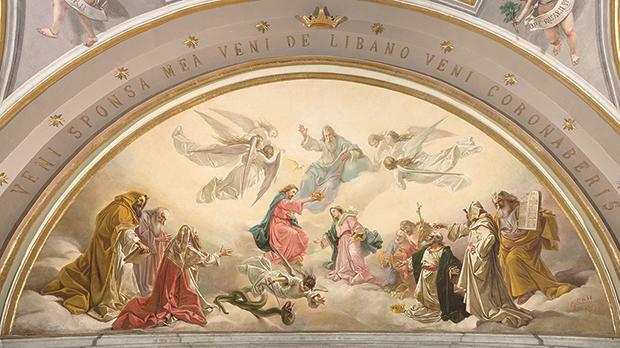 An apse representing the crowning of the Holy Virgin and a main vault painting, representing the Dominican Pope St Pius V beseeching the intercession of the Virgin Mary at the time of the Battle of Lepanto, have just been restored. 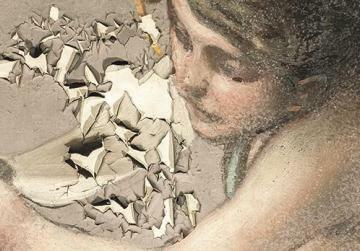 Detail in raking light of the face of the angel in the central vault painting. Large flakes can be seen hanging from the edge of a large loss in the face. Once placed back, key elements of the angel’s face could once again be read, facilitating the reconstructing of the lost area. 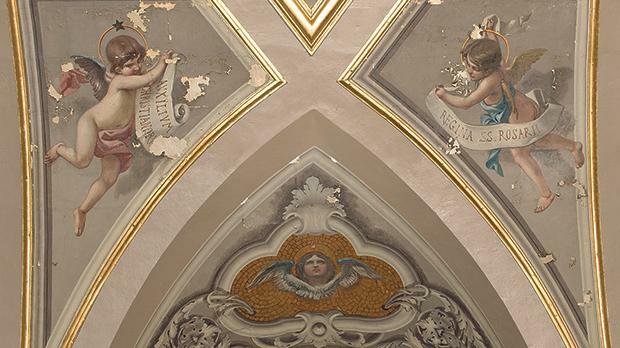 The works by Giuseppe Calì (1846-1930) can be found in the transept chapel dedicated to Our Lady of the Rosary in the Basilica of Our Lady of Porto Salvo, also known as the church of St Dominic, in Valletta. It is defined as an important work because the apse and the vault paintings were the first works by Calì for the Domincan community inside the basilica and his passport to further works there. In fact, all main ceiling paintings were eventually undertaken by Calì. So it comes as no surprise that at the time of undertaking work on the chapel, Calì was not just out to please, but was on a mission to impress his patrons, to sell his bravura to them through the execution of his paintings. This was one of the most exciting factors; one that left all in awe as we stood on the scaffolding, face to face with this monumental work for the first time. Calì’s light and sweet pallette was then hidden underneath dark layers of grime and candle soot. The large number of candles burnt throughout the years in religious celebrations and rituals had left their mark. Instances of water infiltration had also caused damage. The surface of the painting had suffered numerous microscopic losses; other areas had developed extreme detachments with patches that became lost, while numerous areas were defaced by white stains of soluble and unsoluble salts that had ingrained themselves in the paint layer. Yet, Calì’s genius in composition and design, and his interpretation of perspective through his special choice of colour, remained evident. Side angles in visible light. The condition of the painting was poor as a result of being exposed to unstable environments that resulted mainly from successive incidents of rain water infiltration. Inside the semi-circular space of the apse, Christ and the Holy Virgin take the centre stage, while the Holy Father flanked by a circle of angels overlook the scene from the upper area. In the lower part, at both ends of the arrangement, a number of prophets and major personages, including Moses, David, St John the Baptist and St Joseph, look on among extravagant folds upon folds of darapery. There is no economy with the details. To fill the space just below the seated Jesus, the expertly foreshortened figure of Angel Gabriel fights an entwined serpent. The apse becomes a stage with the solemnity of all spiritual in the upper part and a heightened sense of drama in the lower part (note the action created through the gestures of the figures below). His capacity to satisfy both the worldly and the holy in the same painting is pure genius. The scene is not only an evidence of Calì’s genious in design and colour but is also an evidence of his great invention in storytelling, a story that he enriches with gestures and a myriad of iconographic representations. Details in raking light shows diverse forms of deterioration phenomena, ranging from large flaking detachments to minute losses in areas ofsalt efflorsence. 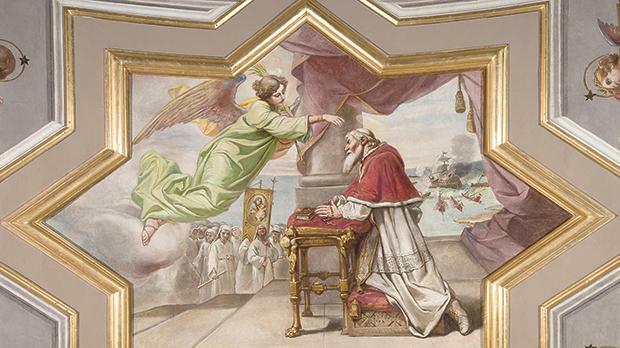 The same applies to his central painting in the vault that is in itself a rich interpretation and documentation of the historical connection between the Pope St Pius V, Our Lady of the Rosary, and the Battle of Lepanto. During the conservation project, the apse and vault paintings were examined and docu­mented. A number of non-invasive investigative techniques were used to help us define important information regarding both technique and the condition of the painting. The study of the whole situation and physical testing ensured a safe and ethical approach. In this way, all surfaces could then be strengthened through a consolidation programme so that they could then be holistically cleaned. Having already conserved other Calì’s works inside the basilica, it was immediately evident that the type of deterioration occuring in the Chapel of the Rosary was different than the deterioration found in Calì’s paintings in other areas of the basilica. Further studies helped define that this could be due to a change in Calì’s technique and his use of materials between these different spaces. This became more clear when considering the timeline of Calì’s execution of works, especially with reference to the works inside the basilica itself. It was noted that in litera­ture, the apse had been assigned a wrong date of maufacture. 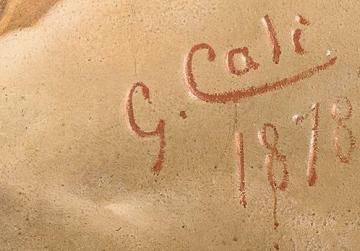 Emmanuel Fiorentino and Louis Grasso, in their publication Giuseppe Calì 1846-1930, quoted the date of the apse as 1898 when in fact it is signed and dated 1878. This is a difference of 20 years and thus places the work way before any of the other works in St Dominic’s church. The work is signed and dated 1878. So when considering the difference in technique between the works in the chapel of Our Lady of the Rosary, executed in his early 1930s, versus Calì’s other works in the basilica executed in his 1950s, all fell into place. Information gained through research, physical investigations and scientific analysis helped define that as he grew older, and during that 20-year span, he became more concerned with the preservation and longevity of his work. During this project, our access to Calì’s work has given us the opportunity to recover original information with regard to the work’s history. Furthermore, all the body of documentation amassed during the project will permit and enable further study, which will shed more insight into Calì’s technique, the history of his work and the deterioration processes with regard to local materials in the local environment. 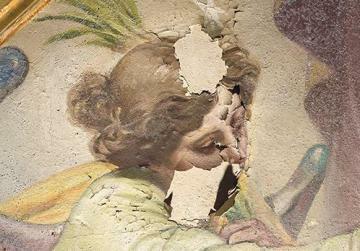 Every artwork has its story... this time of restoration and conservation further reminds us of the story that is sometimes uncovered or just clarified. I would like to thank parish priest Michael Camilleri OP, and the Archconfraternity of the Rosary, rector Joe Zammit, procurator Mario Celeste, secretary Isaac Delmar and all volunteers, with special thanks to Frank Micallef, for their invaluable work. Special thanks also go to my conservation team, and my documentation and scientific support for their input in all our projects. The conservation project was inaugurated last Sunday during the 10am Mass, followed by a public lecture by the author Agatha Grima, who led the conservation team. 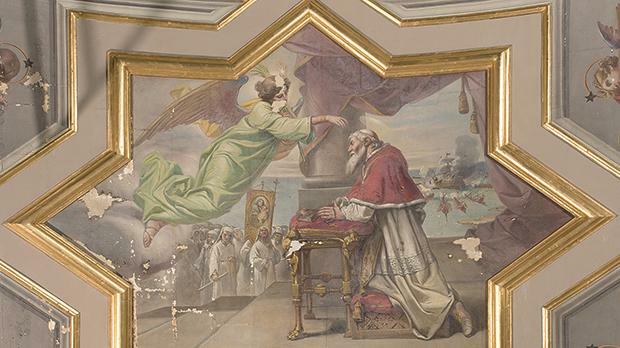 The main vault painting before conservation treatment, showing Pope St Pius V beseeching the intercession of the Virgin Mary at the time of the Battle of Lepanto. 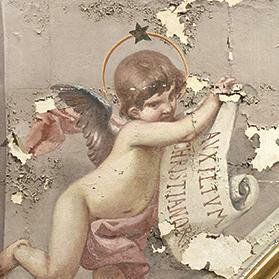 The main vault painting after conservation treatment. Details of the ongoing Battle of Lepanto behind the saint and the procession holding the banner of Our Lady of the Rosary are more easily legible.